In recent years, population growth has seen a considerable increase in pet owners. This is due to the human desire to have a hopeful companion, but also a factor to eliminate stress accumulated daily. The main prefference is for dogs and cats. The average lifespan of a dog is 8-10 years. Thus, during this time, the pet owner has been attached to it and its loss can be very painful. In most cases a pet becomes a member of the family, the owner trying to fully satisfy all his daily needs. When the animal dies, the owner suffers and is willing to offer his "friend" all his condoleances. A pet cemetery is a great solution for both the entrepreneur and for the owners who have lost their four-legged companions. In order to open such a cemetery it is necessary first of all to obtain all the necessary papers from the competent authorities and a land near a city. 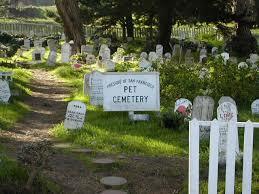 Small "resting places" can be arranged for pets where owners can visit their partners, paying tribute to them. The fee for a resting place can be determined by several factors: available places, initial investment, weight and size of the pet. It is recommended that the fee should be yearly for each pet. BONUS: It is possible to create, with all the legal authorizations, a small shop where pet owners can order customised funeral stones, flower bouquets, pictures or any other items that could pay tribute for "man's best friend", and in time would keep an everlasting memory for the owner. 0 Response to "Pet cemetery"